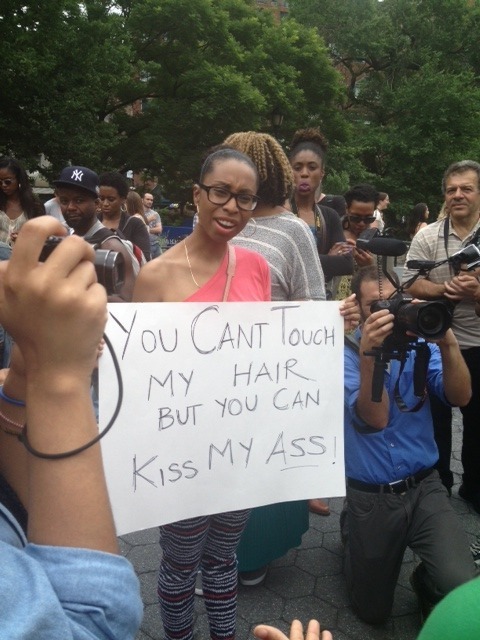 The great debate of the week has been sparked over a Natural Hair Street Exhibit in which people were allowed to touch natural hair with expressed permission. I went down to Union Square Park today to witness the sensation in person. I arrived about 15 minutes after the start time to already see camera crews, curious tourists of all different races, and many naturalistas that came to spectate. For those of you who couldn’t make it, the exhibit will be featured on Totally Biased (FX on Thursday night). As I waited there, I wanted to see people come up to the models and touch their hair. Yet, in the 2 hours that I was there, less than 10 people came up to touch their hair. 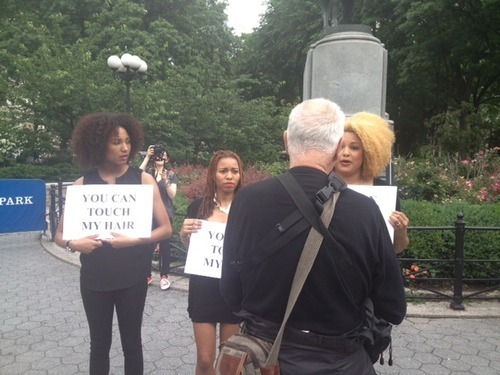 Even with expressed permission, the natural hair models told me people were more interested in asking questions. One model even told me that she had to coerce a few people to touch their hair as many felt resistant to do so. She stated that this experiment was to educate others on natural hair. That many people don’t know about natural hair and what they don’t know, they tend to question. They didn’t feel like they were being put on display like Sarah Baartman or on display in a petting zoo because they gave permission for their hair to be touched. They held the power in the equation. The only instance that they felt uncomfortable with was when 2 individuals actually petted their hair. There’s a distinct difference when you’re touching one’s hair and petting someone like a dog. It’s inappropriate and rude. While some didn’t agree with the exhibit altogether, there were many who thought it was the catalyst to start a discussion. A mission complete in my book. 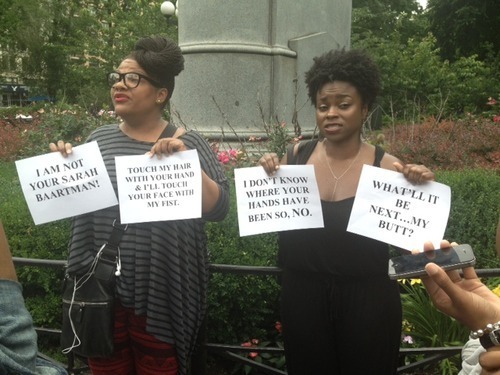 This was an opportunity for me to pick the brain of bystanders and their position on natural hair. I spoke to a history professor from a HBCU (Historically Black College and University) in Mississippi who heard about the exhibit through the newspaper. She discussed how there isn’t much of a natural hair movement out there, and that many of her students cover their hair with weaves, wigs, etc. She emphasized how she feels the issue behind the resistance to natural hair in the South is a lack of confidence. We also discussed how we think women define their beauty with their hair and spend a lot of time on it. She even spoke of her own pixie styled hair cut and her decision to cut her hair short. It was just an easier style for her to manage as she values her time. Another woman I met was doing research on various black hairstyles. She came to the perfect event. I was more than happy to provide her with various sites that helped me in my natural hair journey such as Fotki and YouTube. I shared stories of getting my natural hair combed as a child and my joy in getting my hair relaxed for the first time. This social experiment has done something positive for the natural hair community in that it brought us together to talk. I spoke with people I probably would have never discussed my natural hair experiences with. I helped some to understand the complexity of natural hair. Is the conversation about natural hair done? I’d say no. The curiosity for Black hair will be here to stay as there is much to be learned about our hair. As we learn, others are wondering why we’ve been hiding our hair texture. What was so bad about it? Why didn’t we embrace it? Post your thoughts in the comments section below. A healthy debate is better than silent walls. Speak on it.